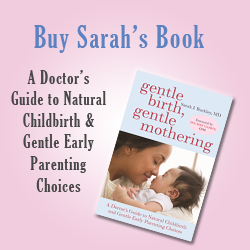 For in-depth information on the science of attachment, see Chapter 11 “Love, Attachment and Your Baby’s Brain” in Gentle Birth, Gentle Mothering: A Doctor’s Guide to Natural Childbirth and Gentle Early Parenting Choices (Sarah J Buckley, Celestial Arts, 2009). The day you bring your baby home from hospital is momentous. She’s fallen asleep in the car, and you carry her into the nursery. It’s freshly painted with a beautiful new bassinet, and a rocking chair for night time feeding. You put her down ever so gently, breathing a sigh of relief; it’s been a big day and you’re dying for a cuppa. Her eyes open a little. By the time you’re at the door she’s whimpering and, before you even get the kettle on, she’s crying. You pick her up. Maybe she’s hungry? She falls asleep as you feed her, and the scene is replayed. You can’t figure it out. Maybe you’re not wrapping her up enough? (But then there’s the fear of SIDS.) Maybe you’re not burping her properly? Maybe she’s having the wrong sort of milk, or not enough, or too much…? In a few days time you begin to worry that you might be spoiling her, as you’ve been warned, by picking her up straight away, but when you delay it takes hours of pacing the floor at night to settle her and you’re desperate for some peace and quiet. Your partner is sleeping in the spare room because he’s back at work by now, and needs a bit of sleep. She still wants to feed all the time, and you haven’t even had time to hang out yesterday’s washing. But it’s a strange thing. After a few weeks you find yourself becoming adept at housekeeping — or at least putting on the kettle — one-handed. And the hours in the rocking chair are a dreamy and increasingly delicious time, when there’s only you and her, and the bliss on her face as she falls asleep, drunk with milk, makes you ignore the perils of feeding her to sleep. You’ve even had her in bed a few times, though you haven’t told anyone, and you managed to catch up on some sleep as well; and your parenting manual, which warns against these things, is gathering dust under the bed somewhere. You’re not living in a cave, but you’re discovering the wisdom of stone-age parenting. Since humans have been on this earth, we have reared our babies in this way, and it has worked because it is what babies, and their mothers, are adapted to; hormonally, physiologically, and developmentally. We are not a caching species, designed for long absences from our mothers in nests and burrows. Such animals do not cry (or they would attract predators) and their milk is extremely high in protein and fat to sustain the young for long periods. We are in every way much closer to the continuous-feeding, carrying mammals,1 as were our stone-age ancestors, and our babies remind us of this when they cry to be carried, to be fed frequently, and to be nestled up against our bodies in sleep. In fact continuous carrying (usually in specially designed slings and carriers), frequent and extended breastfeeding, and mothers co-sleeping with their babies are the norm in most non-western cultures, as they were in our culture 150 years ago.2 US paediatrician and author Dr William Sears has coined the phrase “attachment parenting” 4 which describes both the style and the outcome when babies are cared for in this way. 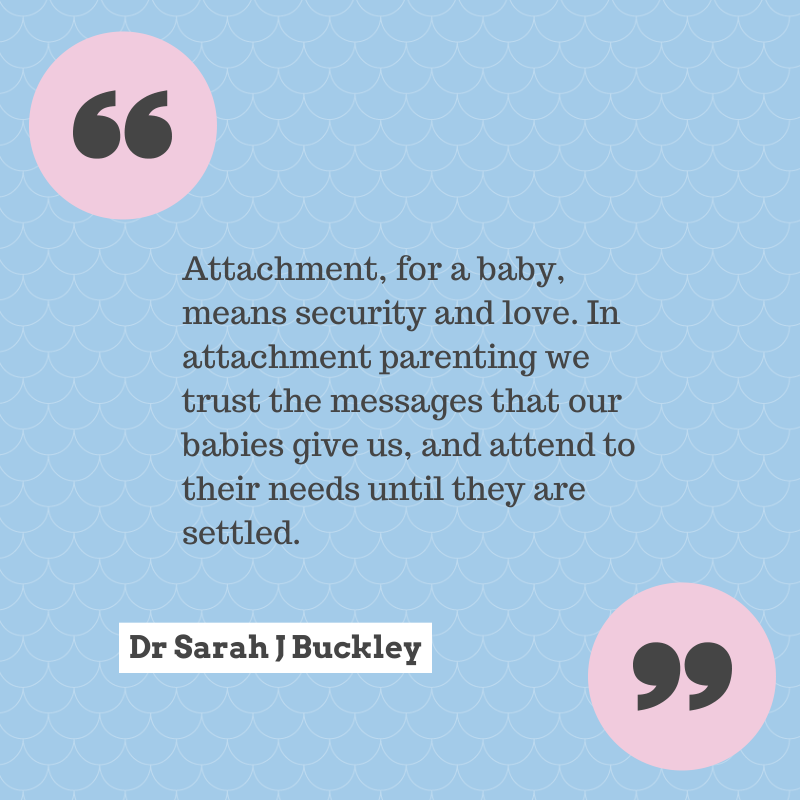 Attachment, for a baby, means security and love. In attachment parenting we trust the messages that our babies give us, and attend to their needs until they are settled. In a society that is obsessed with individualism and independence, ideas that are completely foreign to small babies, it is reassuring to know that developing a secure attachment with your baby in infancy leads to emotional security and independence in later years. And those years arrive sooner than you’d dream of, as you’re feeding you’re baby to sleep, again, at four a.m.
1. McClure V. Crying- Good for you, good for baby. Mothering 1996;84:22-30. 2. Thevenin T. In Support of the Family Bed. Mothering 1996;84:69-72. 3. Thevenin T. The Family Bed: Perigree Trade, 2002. 4. Sears W, Sears M. The Baby Book: Birth to Two Years. Boston: Little, Brown and Company, 2003. 5. Bell SM, Ainsworth MD. Infant crying and maternal responsiveness. Child Dev 1972;43(4):1171-90.